Trick or treat! 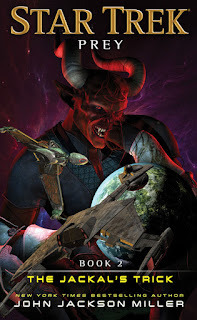 STAR TREK: PREY Book 2: THE JACKAL'S TRICK now on sale! Trick or treat — or trick and treat! The second part of my novel trilogy, Star Trek: Prey Book 2 - The Jackal's Trick has just released from Simon & Schuster/Pocket Books as a mass-market paperback and in e-book format. The second act of our Klingon opera ramps up the tension significantly, with the Klingon-Federation alliance in peril as never before. Lord Korgh has seized control of the House of Kruge, executing a plot one hundred years in the making. The Klingon cult known as the Unsung rampages across the stars, striking from the shadows in their cloaked Birds-of-Prey. And the mysterious figure known as Buxtus Cross launches a scheme that will transform the Klingon Empire forever. Yet even as Commander Worf departs on a deeply personal mission of honor, hidden sinister forces seek to turn the crisis to their advantage. And the conspirators plans threaten to spiral out of control, jeopardizing the very empire they aspire to rule. You can also order signed copies of the book from my online store. And don't forget that the first book of the trilogy is on shelves now — and at Amazon — and then book three, The Hall of Heroes, out on November 29, is accepting preorders. And here's a bit of news that's also welcome: Simon & Schuster plans an unabridged audio presentation of the entire trilogy, due on February 7, 2017. I'll post order links for it once they're available. I have a couple of shop signings in Wisconsin coming up: I'm at Powers Comics in Green Bay from 1-4 on Saturday, October 29 for the Halloween Comicfest event. Then on November 19 I'm at House of Heroes in Oshkosh from 1-4 for Local Comic Book Store Day. Plus I have a whole bunch more podcasts online — check out my Twitter at @jjmfaraway to see as they're posted.